After two years of recession in many countries in the region, Latin America and the Caribbean’s GDP is expected to grow by 1.1 percent on average in 2017 according to the International Monetary Fund (IMF).9 After being hit hard by the end of the commodity boom and seeing exports plummet, current account deficits soar, and government revenues contract, the region is slowly adjusting to new international conditions. The fall in commodity prices and the deterioration of terms of trade led to sharp depreciations of the major currencies in the region. Many believed that the exchange rate would serve as an automatic stabilizer and help boost new export sectors that would reignite growth. This effect was not strong enough to meet expectations and it failed to prevent the steep drop in growth. The slow response of exports revealed the competitiveness challenges in the region (Figure 5). Large gaps in all of the pillars of competitiveness persist, especially in institutions, infrastructure, labor market efficiency, and innovation. The wide range of performance exhibited in the region also contributes to regional inequality. Latin America’s poor performance and the region’s lack of progress in closing gaps with global leaders are associated with low productivity, high informality, insufficient export diversification, and growth that is insufficient to create employment and fund the growing demand for more and better public goods. As Latin America strives to consolidate the social gains it has made in the past decade—a record reduction in poverty and a growing middle class—it must strengthen its capacity to adapt to changing international conditions and rediscover new sources of sustainable growth based on a coherent competitiveness agenda that enables entrepreneurship and new innovative businesses to emerge. The results in the report can help guide the identification of priorities and catalyze public-private collaboration (see Box 3 for examples in Colombia and Mexico). 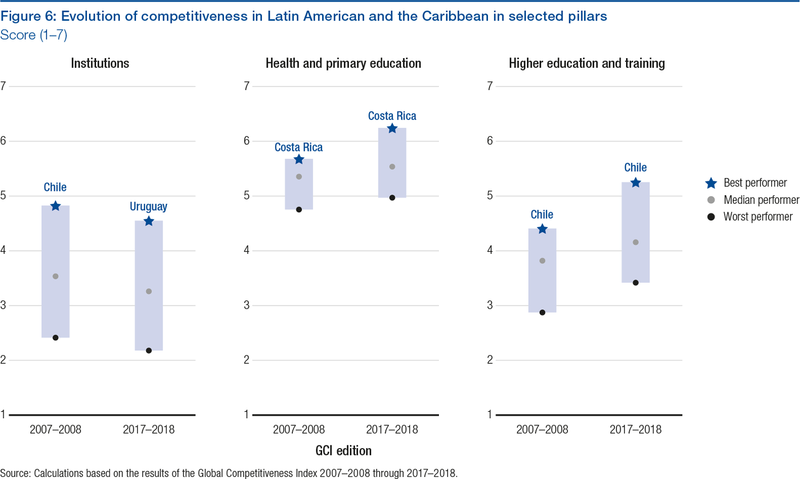 As we look back at a decade of competitiveness monitoring in the region, we see that many of the fundamentals of competitiveness and growth have worsened in Latin America and the Caribbean. Basic requirements such as institutions have deteriorated, with democratic institutions failing in Venezuela and corruption scandals throughout the region, as shown in Figure 6. Trust in government and a crisis in governance continue to represent significant challenges for a region in need of effective public-private collaboration. Efficiency enhancers, measuring how well markets work, have also deteriorated in the region—goods, labor, and financial development have failed to consistently improve. Although, on average, goods markets and financial markets have marginally improved, the distance between the best and the worst in the region continues to increase as Venezuela continues to fall into chaos. Finally, business sophistication has also continued to weaken, reflecting the region’s dearth of structural transformation and lack of truly transformational new sectors and business models. Despite the deterioration of some of the fundamental pillars of competitiveness, the region has made progress in infrastructure and also in human capital—in both health and education (Figure 6). Together with improvements in technological readiness and innovation, these developments will help Latin America and the Caribbean discover new sources of growth and guarantee inclusive and broad-based growth. Unequal performance on the macroeconomic pillar reflects the size of the negative macroeconomic shock of the last couple of years and the challenge of restoring stability. Mexico places 51st with an overall score that increases, indicating that the country has continued to make progress but at a relatively slower rate than other countries. The main reduction in score is in the institutions pillar, with efficiency in government spending falling in both score and rank. Private institutions also worsen, with deteriorations in corporate ethics and responsibility. After significant efforts to implement efficiency-enhancing reforms, the slow progress this year signals the need to increase the speed and depth of reforms that will improve the allocation of factors of production and the competitive forces driving innovation and rivalry in product markets. Brazil improves to 80th position, leveling off after several years of falling in the rankings. After being rocked by corruption scandals and political instability, the institutions pillar recovers 11 positions, showing the effects of investigations leading to more transparency and a perception of successful proceedings to curb corruption within the institutional limits of Brazil’s constitution. Following two years of falling GDP growth and worsening macroeconomic conditions, Brazil this year improves slightly, bringing inflation and government deficits back under control. Efficiency enhancers also advance this year, with improvements in goods market efficiency. Brazil’s largest progress comes in the innovation pillar, with upturns in many of the indicators, indicating an enhanced capacity for innovation, more industry-university-business collaboration, a higher quality of research, and better-trained scientists and engineers. Argentina improves 12 positions to rank 92nd this year, boosted by a better performance in basic requirements. In particular, institutions improve significantly and consistently, reflecting renewed trust in public and private institutions. Technological adoption, business sophistication, and innovation all improve, signaling a reconversion process in Argentina and reflecting new sources of growth. As the government implements reforms that target distortions affecting market efficiency, some indicators of goods markets, labor markets, and financial development are starting to improve. These small improvements are indicative of the road ahead. In 2006, Colombia defined a vision for the year 2032 in which the country would be one of the three most competitive in Latin America, with a per capita income equivalent to that of a medium-high-income country and an economy that exports high-value-added goods and services. To achieve this aim, the national government and the private sector—led by a group of entrepreneurs—decided to create an institutional arrangement for competitiveness, now called the National System of Competitiveness, Science, Technology and Innovation. Following the establishment of this arrangement, the same group of entrepreneurs formed the Private Council on Competitiveness to work hand in hand with the government in identifying and coordinating initiatives to help the country achieve the 2032 goal. The most salient challenge in this type of long-term, collaborative work between public officials and private-sector leaders is the absence of measurable and objective indicators for progress. Usually reforms in the areas of competitiveness have impacts that are not evident in the short term, and they require continuous work that goes beyond the scope of a single administration. 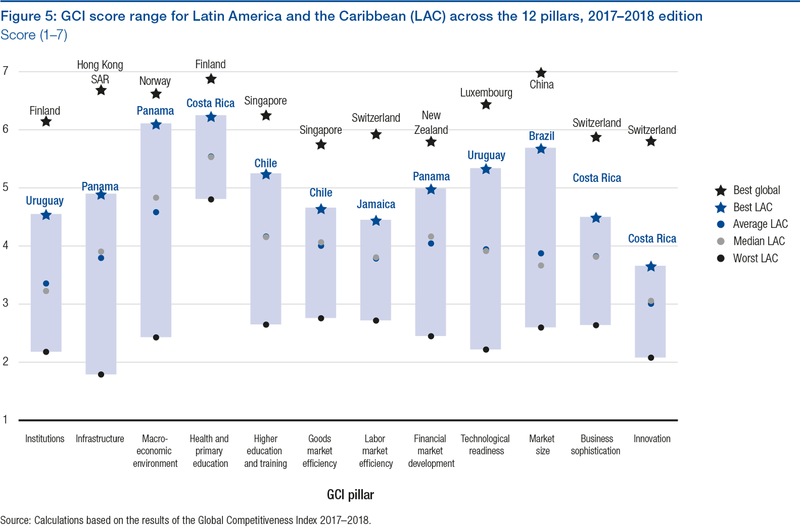 Hence the Global Competitiveness Index (GCI) quickly became a guiding tool for the country, and its results are reviewed and monitored by the President of Colombia, leaders from the private sector, and civil society representatives in the National System’s Commission at the end of each year. The GCI is also used systematically by the Private Council on Competitiveness, which publishes an Annual Report that analyzes the performance of Colombia in each one of the GCI pillars. This report presents a comprehensive diagnosis of the issues that need to be reformed, an analysis of opportunities to promote productivity, and a possible set of solutions that could advance Colombia’s agenda with the collaboration of governments and firms. Furthermore, in 2013 the Private Council on Competitiveness partnered with Universidad del Rosario to design a subnational Department Competitiveness Index based on the GCI framework. Now in its fourth edition, this regional index has become a tool for local governments and private-sector organizations to monitor their performance, replicating the role that the GCI plays at a national level. Across the world, growth and productivity have slowed while middle classes in some industrialized countries face rising levels of inequality and insecurity. An expanding middle class in emerging markets also has higher aspirations and increased demand for quality public goods. Middle classes across both industrialized and emerging countries are putting increased pressure on governments. As a consequence, electorates are pushing back against some of the features of globalization. Policymakers must work urgently to identify priorities for public policy action jointly with the private sector. Based on the findings of World Economic Forum’s Global Competitiveness Report and Inclusive Growth and Development Report, the methodology of workshops and competitiveness labs, and new work with the OECD Development Centre on policy prioritization, the Competitiveness Lab helps to develop public-private action plans for growth and inclusion. b1 Contributed by the Colombian Private Council on Competitiveness. b2 The full report can be found at http://www3.weforum.org/docs/WEF_White_Paper_Mexico_Competitiveness_Lab.pdf.